Report 2010: an exceptional year in every way! The 22nd festival is marked by its exceptional configuration: concentrate on two days in a single projection room with a calendar and shifted on Monday 1 and Tuesday, November 2, 2010. Finally, the 2010 edition had a very good attendance, especially the holiday, which has not been without problems in terms of organization. For a shortened half and excluding weekends, with 1100 accessions, the reduction is only 35%. Of this total, the share of membership support is progressing which is partly explained by the lack of passes this year. As for the relative increase memberships at a discount, it probably reflects current economic difficulties. We thank the members who have renewed their membership without coming to the festival to support the work of the association. Entries room larger drop (-50% gross). However, 3 293 entries on twelve sessions is almost a score equivalent to the previous year (an average of 274 spectators per session cons 287). Indeed, comparing the number 2010 to 2009 reduced to the same period, the decline is only 0.2%. The selection included 50 films from 18 different countries. The largest inflows related feature films, Viola di mare (589 entries) and Elena Undone (436), the session La Valse à mille temps with the documentary Edie & Thea (425) and two sessions of short films, Double regard (325) and Jeunesse dans tous ses états (292). The short duration of the festival has achieved satisfactory results for difficult times such as Monday at 12am (227 entries for 40 years MLF) and Tuesday at 10am (158 entries for Amoureuses, audacieuses !). Only two meetings were held in harsh conditions, 40 of MLF: insights from feminism and lesbians and the tribute to à Michèle Causse. The late confirmation of the venue and dates failed to put up an installation of works of creative specifically designed to place as planned in the exposure draft of the commission, however, a series of posters feminists and lesbians historic been hung in the lobby bar with the help of the Archives lesbiennes. And if the installation constraints have prevented the organization of an opening concert, a few volunteers of the team were able to grace the opening sessions of their flagship wild performances. 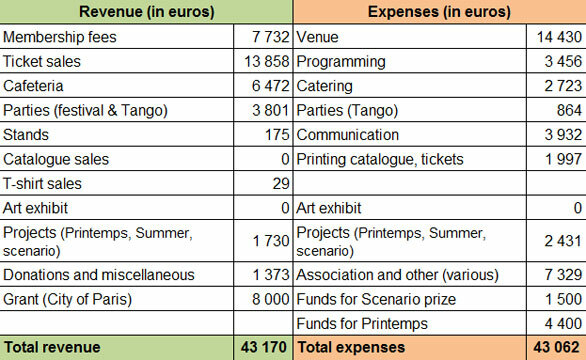 The annual accounts show a small surplus (108 €) and the festival itself is redundant. The uncertainty on the expected attendance because of exceptional circumstances already mentioned led the team with extreme caution in spending while the crowd was above our expectations. Fees dedicated to the rental, technical equipment and programming decreases in proportion, but it is not the same for communication because the changes require considerable guidance on information. Despite being in a poorly ventilated and poorly adapted, the team has accomplished the feat cafeteria to help finance the festival to the tune of € 3,749 while satisfying the festival. The grant from the City of Paris, under the Observatory of gender equality is stable (8,000 €). Another unique feature of this year 2010: two other film events were organized, Le Printemps de Cineffable 7-18 April and Summer of Lez July 3. If these two festivals open to all and not all have balanced their budget, they have contributed to continuous visibility Cineffable actions, as well as three nights at Tango series of Thés au Gazon. All this activity, in addition to the location search that continued throughout the year and adaptation to the constraints of Espace Reuilly, required a greater commitment to organizing volunteers. In 2011, research continues to rise in parallel with the preparation of Printemps de Cineffable exceptional and a second festival at Espace Reuilly which implies a rethinking of many areas of the organization in light of experience acquired in 2010. The grant application was renewed and a provision was created to reflect the deferral of part of the lineup for the 22nd festival on the Printemps de Cineffable 2011.